Oh, yeah, I’m sure I tightened it more than that. Is there a valve in there or will the sump drain if I take the line loose? Off hand I think you will drain your sump f you loosen the line. Next oil change might be the best time to do some more exploring, from memory there is an o-ring in there, given the mileage you have racked up it may have just given up the ghost. The parts fiche shows a sealing washer under the "reduction" adapter to the sump. I was hoping the leak was there, but looks to be the pipe fitting itself. I have "reseated" it and will hope for the best. Otherwise, time for another $100 gift for the Old Girl. I would think the Guzzi is using AN style fittings on the end of that line, but I don't know. The bit about excessive tightening damaging the threads was, I thought, referring to the NPT fittings which are tapered. Excessive tightening will damage tapered threads. If it is, as I suspect, using AN style connections which use a tapered seat and not tapered threads, you should be fine. You may need to disassemble and clean the tapered seat. There may be some gunk or debris that is preventing the tapered seat from sealing. 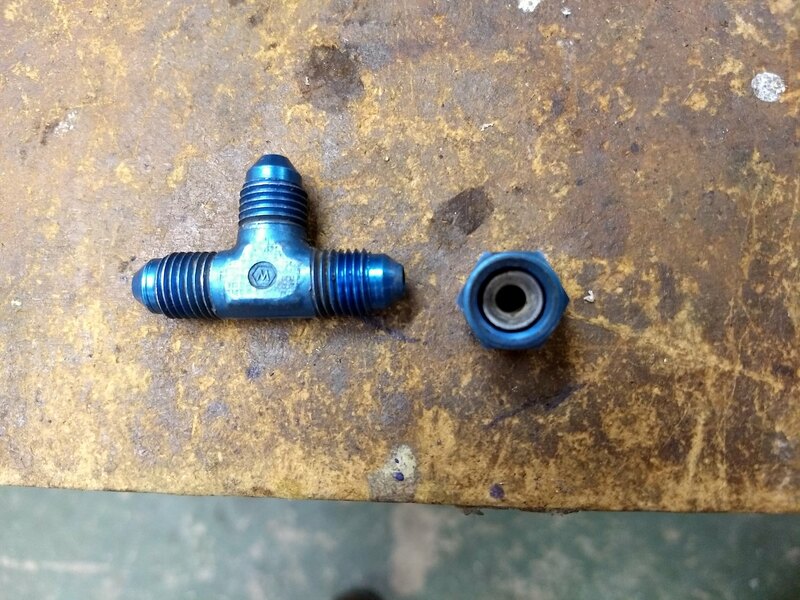 Keep in mind, if it is using AN style fittings the threads are not a sealing surface. I have seen people use thread tape or other thread sealants on AN style fittings. That is counter-productive, don't do that. If it is a tapered thread fitting thread sealant can help. But if it has a tapered seat and not tapered threads the threads themselves are not a sealing surface and should not be treated as such. Now, if it is using a tapered thread as NPT fittings do, seal the threads and tighten till it justafeet (that is Italian for "just fits"). *assuming* they are AN fittings.. there is probably a crack in the flare. That is the common failure. Would a crack be visible on inspection? Some special technique to reveal it? Nope, the flare is formed to fit the male fitting Swooshdave posted. The nut holds the flare against the fitting. The crack will be on the flare..
All this is *assuming* it's an AN fitting, which it appears to be. I'll post up a picture if it will clarify how it goes together..
Ok, *if* it is an AN type fitting, the male part coming out of the sump will look like the piece on the left. You can see the flare on the tubing inside the nut. Normally, a failure is a crack in that formed flair. The good thing is.. it's not suddenly going to fail and dump all your oil on the rear tire. The bad thing is you have to take the fitting apart to inspect it, thereby losing all your oil..
Well, duh.. I finally got an look at the parts manual, and you're in luck. It'll just be that O ring. Probably. At any rate, I'd run it until the next oil change, then take it apart and have a look. It *could* be that gasket..but from your picture, I think it's the o ring. Cheap. Also when you have things apart measure the threads and put it in the database. AN is not metric but I don't know if there is a metric equivalent, but I'd be shocked if there wasn't. I've been shocked before. I cannot find an actual "O-ring" in the parts detail, "Oil Pump", Page 42. 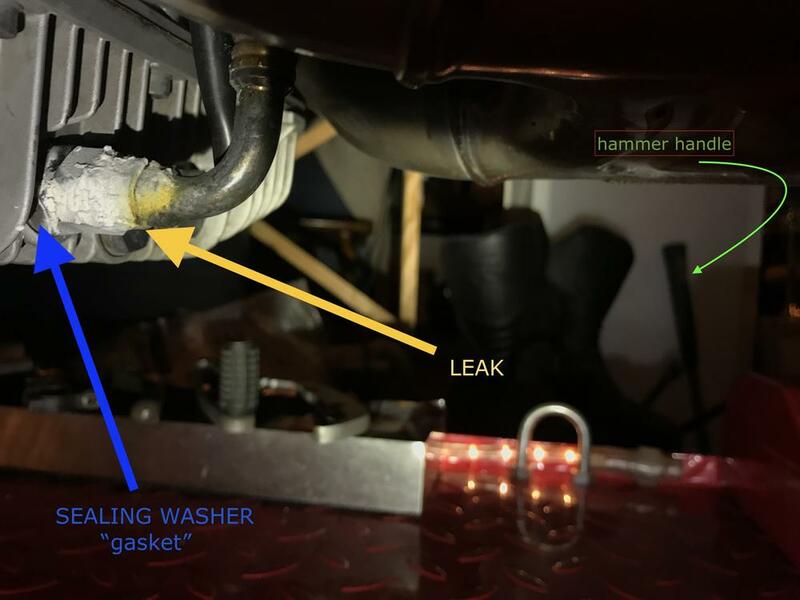 The #24 "pipe" assembles to the #21"reducer" (adapter) that is screwed into the sump over #20 "gasket" which, upon inspection looks to be a polymer lined "sealing washer" (GU01154230). The same sealing washers used on the banjo fitting at the top of the line and the oil lines to the Oil Cooler, Page 43. My parts drawing sez 26 O ring GU 90706010 it goes over the male end of # 21under the nut on 24. It's for an 03, though.. Interesting. Thanks for that part #. All of the other part numbers are the same?